Thanks to Costco and an abundance of storage space, we have become quite accustomed to buying in bulk. 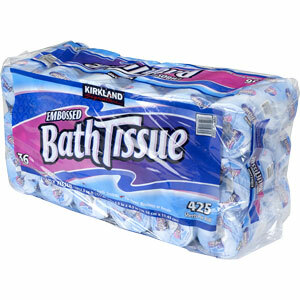 When we move to Miami, Costco is not going anywhere--36-roll packages of toilet paper will be just as accessible then as they are now. What will disappear is the extra space where we can store such a monstrosity. A boat makes a very efficient use of a relatively tiny space. Because a boat devotes almost every cubic inch of interior space to necessary functions, there is no available room for storing six or seven cubic feet of paper products. The result is that our bulk-buying practices are about to be radically altered. Some our bulk purchases have already stopped, not to prepare ourselves for boat living, but for purely economic reasons. It is easy to presume that all bulk purchases are cheaper per unit than normal purchases, but that is not always the case. For example, we used to buy a large tray of canned tomatoes at Costco every month or two, right up until I realized that we can buy them one at a time at our regular supermarket for less. It is definitely worth doing the math on bulk purchases; some of the results may be surprising. In addition, we realized that we were throwing away the remains of some our bulk purchases, either because we could not consume all of the product before it expired (e.g., five pounds of shredded cheese), or because we grew tired of it. A bulk buy that results in some of the product going to waste is unlikely to be a bargain in the end. So, an inability to buy in bulk is not always a bad thing. Further, not all bulk purchases are too large to keep on a boat. The bottle of allergy medicine that I buy at Costco is still, well, a little bottle of medicine that fits in a medicine cabinet. The eight-pack of cans of tuna will similarly fit in our cupboard, the bulk package of dried fruit will fit in our refrigerator, and the big bag of frozen green beans--while big for a bag of green beans--is not too big to fit in a boat's freezer. So some of our favorite bulk buys are not going anywhere. Bulk toilet paper, on the other hand, well, it's days are through. It is, to be sure, a fantastic bulk buy if you have the room. It is cheap per unit, and there is zero chance that any of it will go to waste--it lasts forever and you won't grow tired of it. But it is simply too big, much like the bulk paper towels, bulk pop cans (which are often not cheaper per unit than a 12-pack, by the way), and bulk potato chips. So we are going to have to return to the pre-Costco days of buying toilet paper in smaller packages, paying slightly more per roll, and slightly increasing the odds of running completely out of toilet paper at an inopportune time.